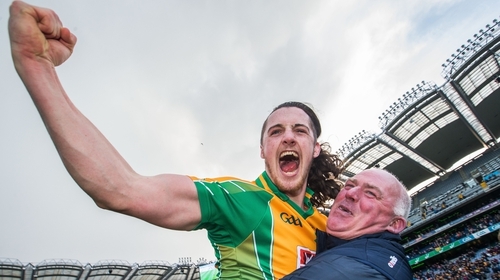 A footballing lesson was handed out in Croke Park on St Patrick's Day as Galway's Corofin put Dr Crokes of Kerry to the sword in claiming a fourth All-Ireland club title. Many plaudits came the way of the Connacht side afterwards for the style of football they served up. Crokes selector Niall O'Callaghan admitted to RTÉ Sport: "We got schooled by the best team, they showed us how to play the game". One of the Corofin stars is Kieran Molloy and last weekend the half-back was named Player of the Year at the AIB GAA Club Players’ Awards. Indeed, Molloy was one of seven Corofin players named on the overall best 15 of the provincial and All-Ireland stage of the club championship. When asked to sum up Corofin's footballing philosophy, the defender said: "We have always had a licence to go out and play football. It's been drilled into is since we were six or seven. When you get the ball, you look up and try to find the player in the best position. That's the basics of the game. "So when we reach minor, everybody is tuned in, everybody has the necessary skillset." "It's nice when you hear people saying that we play with a 'swashbuckling' style but I have to say it's very easy being part of this Corofin side. "You know the runs lads are going to make and when you look up with the ball you know where lads are going to be. There's a weight lifted off your shoulder. You can go out and play with a smile on your face." With another club title in the bag, Molloy is now looking forward to inter-county battles and the upcoming Connacht championship where Galway are the holders. "It's a big summer for Galway and I feel we can achieve big things," he added. "I watched Mayo win the league and they'll be really confident heading into the championship. There's going to be some great games in Connacht but Galway will be ready for the challenge. I can't wait for it."